That is just your hormones talking. That is mother natures way of jerking your chain. So when you are overcome by those mushy baby feelings, READ THIS!!! 1) You only have two hands! One for each kid, nuff said. 2) There are two of us and two them. I much prefer a man to man defense because I know I would get stuck with all the crappy zones (pun intended). 3) You grew up with two siblings, someone always got left out. (5) Until you have another one to even the numbers and then there will be four of them! (6) There goes the guest room. (7) Two words- Mini. Van. (8) As it stands you have ZERO weddings to pay for, don’t temp fate. (9) You’ve paid for the IUD, you should get every pennies worth out of it!! (10) You have finally grown back the hair you lost and it might not all come back next time! Love this! I need to refer to this post the next time I’m feeling the need for another little one. 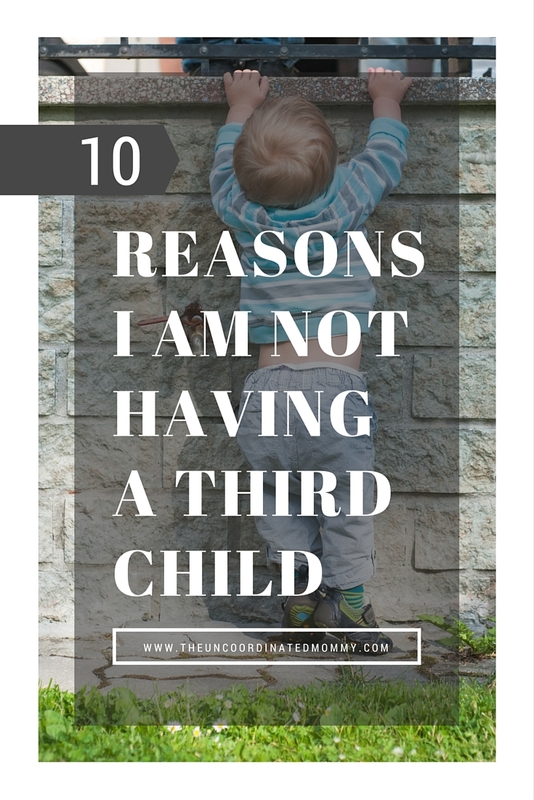 I have no idea if we’ll have #3 or not…but most of those reasons have definitely crossed my mind on the “no” list! I don’t even want to think about #7. Call me superficial but that would deter me! Seriously, I can barely handle two! Thanks for stopping by!! I don’t mind being outnumbered but I would have had 5 if I could have! I think I actually had a harder time going from 1 to 2. Once I hit 3 it wasn’t a big deal. My 4th was a surprise package after a 6 year gap. During that 6 years, I had plenty of times that I felt that baby hungry tug. Now? None, nope, nada. I’ll hold a newborn and even shed a few tears over their sweetness but it doesn’t make me want to have another baby in the slightest. So yay for that. Ha ha, I kind of wish I was a mini van person 🙂 It would be SO much more convenient but I just can’t do it and I know if I had another kid I would do it. Two kids, two hands.. that’s all the explanation you need! I’ve had moments where I thought a 3rd would be nice, but I have to say, 2 keep me busy enough!! Having 2 was the hardest. Going to 3 was a breeze. I’m about to have #7 and it’s just one more to throw on the pile. And for the record, no, I don’t enjoy kids. But I enjoy mine. Holy Moley! #7?? I can’t even imagine. 🙂 I have heard that going to two is the hardest transition. I’m too chicken to do it all again though! As a 60 year old Mom of five, (my baby just turned 21) I can tell you that I have never met any one who wishes she had fewer children but all my friends who have two or three children regrets not having more. Each one of my children bring a special joy to my husband and I but seeing what they mean to each other, how they support one another, and how they come to each other’s rescue can bring my husband and I to tears. It’s a big world out there and family is forever. I am one of six, there are twenty eight grandchildren (we all spent a lot of time together ) and their is strength in numbers. I have 10 kids and one more due in December. You know what I call people with only two kids? Quitters! LOL please know that I am SO just kidding!! I truly believe we all know our own limits and we should stick to them! And everyone has their number. For some that number is two, for others three or four, and for the really crazy their number is ten or more! Ha! Kidding about that, too, because I am not crazy. I love my large family. Wouldn’t have it any other way.